Although the Wander was, and is, designed as a walk, hence the name, an increasing number of entrants choose to run it each year. Inevitably, the fastest treat it as a race so, for those wishing to know how they fared, click on Results for placings and times (revised 17/4/19). Please note than many participants changed from long to short route, and vice versa, on the day, and though some effort has been made to reflect this, it may not be completely accurate. Also,there were some issues with entrants taking the wrong numbers- if anyone notices this and can help correct please email Barrie and he will endeavour to correct them. The ground was dry and the weather bright but with a cold wind. This seemed to please the runners because there were some very fast times, with Lee Athersmith of Skipton first home in the 23.2 mile Long run in 149.12min, a whole 30 minutes faster than his time in 2017!! First home on the Short route was again young Jake Dorman of Newcastle in 86.12min, which was 9 minutes faster than his 2017 time. He is the grandson of one of the Rotarian marshals, John Borrill. For the majority of walkers, with time to have a relaxed and sociable walk, while enjoying the views, this was another great day, despite the cold wind. 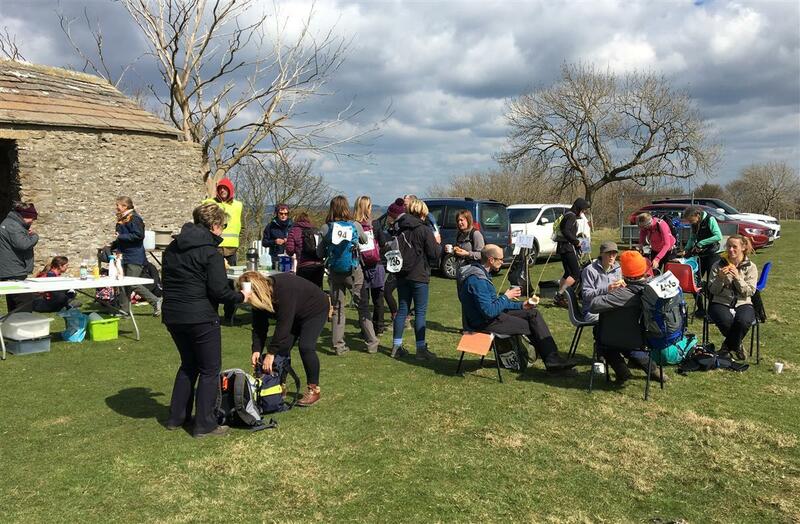 Refreshments at Rubbing Houses on Middleham High Moor, the 13 mile checkpoint, are always appreciated, but the piping hot "real" sausages, cooked on a barbecue, were particularly enjoyed! We would like to thank the RAYNET volunteer radio operators, our wives/husbands who have helped, and of course all walkers and runners for supporting the event. We will have raised in excess of £4,000 for charity, and President David Spashett presented a cheque for £2,500 to Yorkshire Cancer Research at the Finish in Wensleydale School, pending a final count up. There are over 100 photos on the slideshow at the top of this page. You may find you prefer to click on the Thumbnail view and be selective- clicking on any one links to a larger image and better manual slideshow. Thanks to Rtn Chris Wheatley for the photos. Next year's date is Saturday 18th April, so we hope to see you again!